Labyrinth designed by Yvonne Q. Center stone by Gene Q. Words and photos by Yvonne. force is behind a hurricane. I hope this season is a quiet one. after a very long dry spell. It wasn't much, but it was a blessing. I could almost hear the water drops singing. 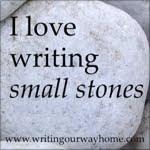 so I wrote this small stone. ....where you will find enchantments, oddments and things that make me smile. I am a Texas native. My husband and I live in the Wild Horse Desert/Gulf Coast area of deep south Texas. Since I retired I love to focus on my art. I love quotes, music, books, flowers, gardening and anything that will awaken my soul. I believe that life is about the journey and the experience of creation. I just try to savor each day.